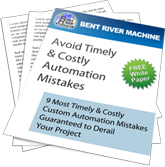 Through the years of designing and manufacturing custom automation, Bent River became aware of large product gaps in the market for its customers. After careful market research yielded dead-ends in both functionality and budget constraints, the line of Bent River Machine products was born. The Bent River Machine Panel Laminators are unique in that their control systems can be easily configured by the user for precise process control. Our laminators offer price versus performance ratio that is unequaled in the industry. 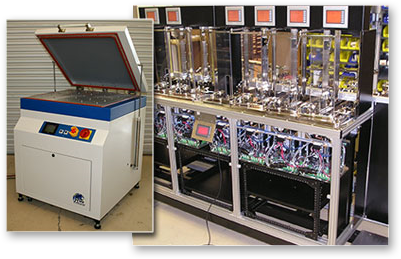 With our laminators, production lines run uninterrupted while your research development teams have the tools they need to create and refine new products OR start-up manufacturing companies can drastically reduce initial capital investment requirements. 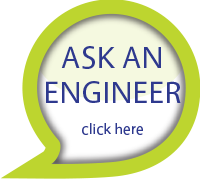 In additional to solar panel technologies, we’ve discovered that there’s an application for our laminators in flat panel development and design. If your organization is experimenting with, or manufacturing flat panels or touch-screens (tablets, cell phones, cars, ovens, etc), they can be laminated in one of the Bent River laminators. Our Handlers are working in production lines all over the world. They buffer product and present it on command in the Bioengineering, Semi conductor, medical and specialized markets. Some of them have been working 24-7 for over 15 years. Need to raise or lower pallets on a palletizing production line? Bent River’s line of pallet elevators have up to a 6,000lb. capacity that can easily be accessed with an electric pallet jack directly from the floor or use the elevator to transfer to a various heights of conveyors. No pit mounting required. Our other products are all the results of needs that our customers had that we were not able to purchase solutions for. We designed a very consistent, low volume pump for scientific instruments. We have designed and tested very precise and easily controlled ball valve for a fluid application that a customer had. There is also an ESD rated Resistor for clean rooms and highly controlled environment in the Bent River Product family.